You can select any of the first five of these options in the Lock Screen option in Settings. Encrypting everything on your phone (the sixth listed option) has some serious implications. This should be old hat by now. Tap the Lock Screen and Security link. This brings up the options seen here. You set some of the options mentioned previously from this page and others when you follow the next instruction. This can be a little confusing. 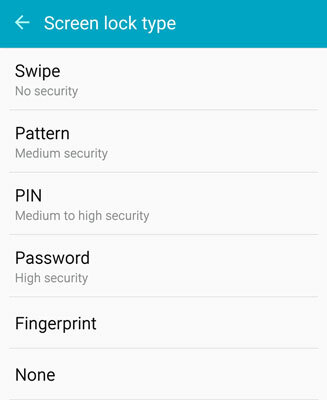 The Lock Screen and Security options. Tap the Screen Lock Type link. This brings up the options seen here. Each option prompts you through what it needs before establishing your security selection. To clarify definitions, a PIN is a series of numbers. In this case, the PIN is four digits. A password is a series of numbers, upper- and lowercase letters, and sometimes special characters, and is typically longer than four characters. A PIN is pretty secure, but a password is usually more secure. Have them both ready, but decide which one you would prefer to use. The first option, unlocking your phone with a swipe, fools exactly no one and doesn’t slow anyone down. Rather than just having the Home screen appear, your phone tells you to swipe your finger on the screen to get to the Home screen. This is about as secure as waving at an intruder. Draw out a pattern as the minimum screen-lock option. This is quick and easy. Tap the Pattern option on the screen seen in the following figure to get started. The phone asks you to enter your pattern, and then asks you to enter it again. It then asks you to enter a PIN in case you forget your pattern. The unlock pattern is a design that you draw with your finger on a nine-dot screen, as shown. 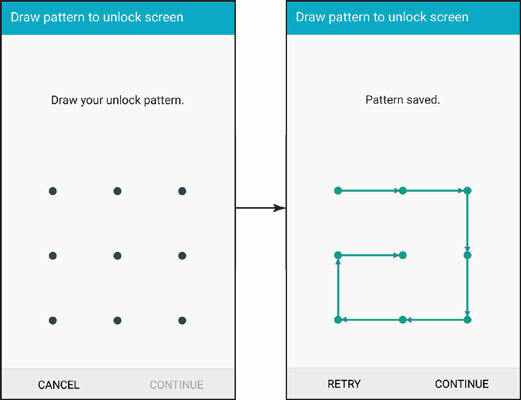 The unlock patterns: the blank screen and a sample pattern. The image on the right happens to include all nine dots. You do not need to use all the dots. The minimum number of dots you must touch is four. The upper limit is nine because you can only touch each dot once. As long as you can remember your pattern, feel free to be creative. Be sure to use a PIN you can remember a long time from now. You only need this PIN if you forget your pattern. That is a very rare situation for most. The next two options on the Screen Lock screen, PIN and Password, are more secure, but only as long as you avoid the obvious choices. If you insist upon using the PIN “0000” or “1111” or the word “password” as your password, don’t waste your time. It’s standard operating procedure within the typical den of thieves to try these sequences first. That’s because so many people use these obvious choices. If, someday, you forget your pattern, your PIN, or your password, the only option is to do a complete reset of your phone back to original factory settings. In such a case, all your texts and stored files will be lost. Try to avoid this fate: Remember your pattern, PIN, or password. 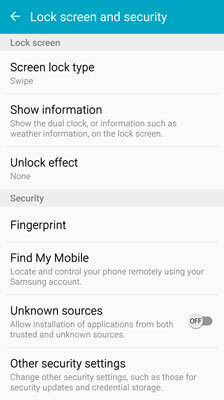 Tap on the Fingerprint link in the Screen Lock Type page. Here is a chance for confusion. 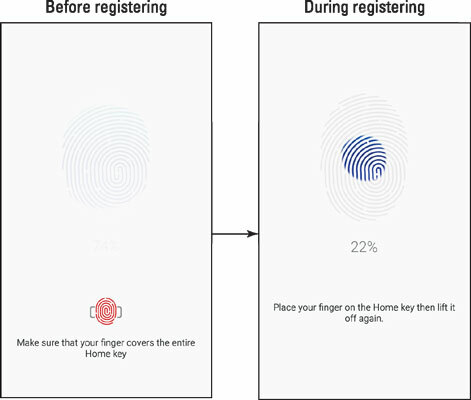 If you tap Fingerprint on the Lock Screen and Security page, you will be taken to a screen that manages the fingerprints stored on the phone. What you want is the Fingerprint link from the Screen Lock Type page. This will bring up the left image seen in the following figure. Press and hold lightly the Home button repeatedly. This brings up the screen seen on the right. Keep tapping until you reach 100%. The grayed out fingerprint will turn completely blue and then you get a congratulations screen letting you know that you are at 100%. Enter the password you have ready. Your fingerprint is now in memory. You can use it to unlock your phone or automatically enter your password for Samsung apps and PayPal. As time goes on, more and more applications will offer you the option of using your fingerprint instead of entering a password. Even if you use your fingerprint, you must also enter a password. This is in case the phone is unable to recognize your fingerprint for some reason.